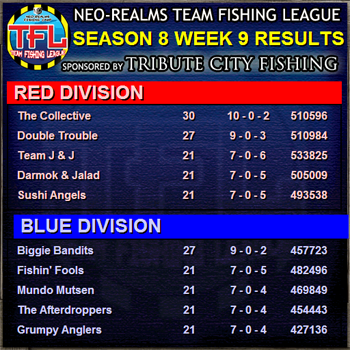 Season 8 Week 10 Results, Playoffs Begin! Week 10 is over, ending the regular season! 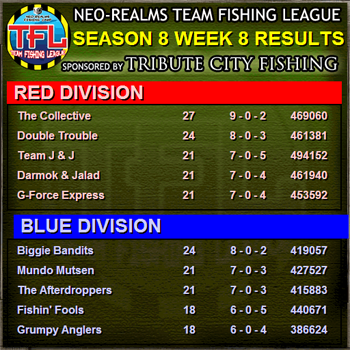 Congrats to The Collective, Double Trouble, Sushi Angels and G-Force Express in the Red Division, and Biggie Bandits, Mundo Mutsen, The Afterdroppers and Grumpy Anglers in Blue Division for finishing in the top 4 prize spots! Week 9 is over and only one more week of matches before the playoffs! In Red Division, The Collective and Double Trouble have wrapped up the playoff positions, but the race for first seed is still open. In Blue Division, Biggie Bandits have secured the first playoff spot, with the second spot up in the air between any of 7 teams! 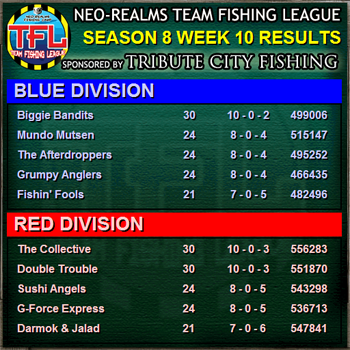 Week 8 is over and The Collective of Red Division and Biggie Bandits of Blue Division have hung on to the lead. Still 2 more weeks worth of matches before playoffs! Week 7 is in the books and we have only 3 weeks left of the regular season! 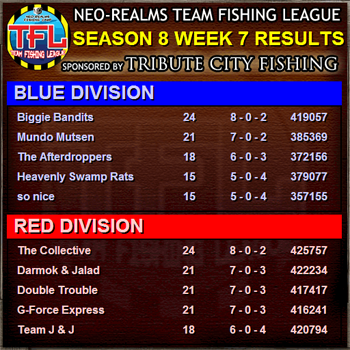 In Blue Division, Biggie Bandits has a one game lead as does The Collective in Red Division. Good luck to all teams this week! 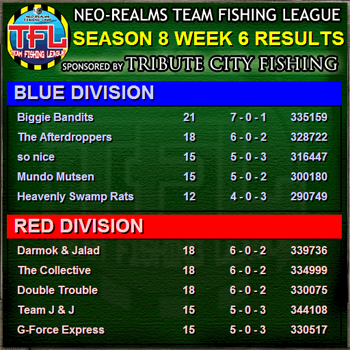 After Week 6 The Biggie Bandits remain on top of Blue Division, while Red Division has three on top with Darmok & Jalad, The Collective and Double Trouble sharing the lead.